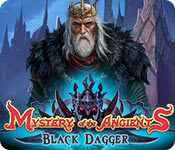 Mystery of the Ancients: Black Dagger is rated 3.9 out of 5 by 15. Rated 5 out of 5 by deddu from Save the Town From the Past I totally agree with all the other comments on this game -- it is fun from beginning to end. I would add that I really liked the variety of mini-games (some very familiar but enjoyable) and the hidden objects where you find an item use it to find another one, etc. Rated 5 out of 5 by LikeAGoodStory from Nice Mix of Play and Story Story is important to me, and I liked this mixture of detective and a bit of magic. Frankly, I favor whodunit and detective stories with little gore and few dark, bone-strewn scenes, and I was not disappointed. This is my first Mystery of the Ancients, and I intend to try another. For me, this was just the right mixture of story, strategy, mini games, and HOPs (these were particularly good). Well done, developers. Rated 5 out of 5 by CiCiRR from Finally I quit my membership with Big Fish because many of the games were becoming too "Harry Potter" like. Magic symbols, gizmos and runes that have no bearing in the real world, or honestly make no sense to real people. My mind is just not that dark and mysterious. But this game, this game finally makes sense. A saw that actually cuts wood instead of a shark with jagged teeth. Mini-games logical to solve, but not too logical to make them easy. The whole game, so far experienced in the trial, just makes sense. The storyline is not outrageous. Meaning it's believable. Not too many games released recently provide the common-sense approach that makes this game such a joy to play. Congrats to the developers for bringing a bit of the real world into an otherwise cosmic genre so alien to most normal folks. Maybe that crap manifests itself later in the game, but so far in the trial, I applaud EVERYTHING. Rated 5 out of 5 by charlene_lane from DEFEAT THE DARK KING REVIEW FROM COMPLETED GAME AND BONUS What a terrific game and I really enjoyed it. There are: * Voiceovers (with dialogue); * Casual, Advanced, Expert and Custom modes; * Interactive map. The graphics are great - colours are bright but not garish and everywhere is clear to see - no gloomy scenes. The music is orchestral and nice to listen to. 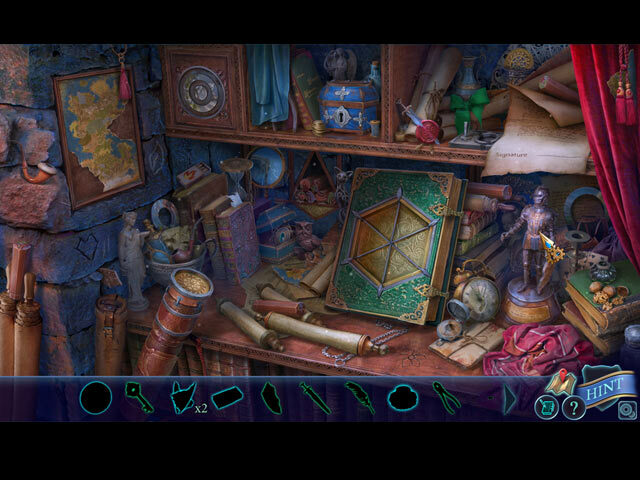 The hidden object games are highly interactive straightforward, silhouette, finding similar pairs and finding one item to use to find another, etc. Items are clear to see and each HOP takes around 3-5 minutes to do. There are a huge variety of different mini-games to play. These are all very easy to do. I've seen them all before but I always enjoy doing them again. Even if you don't like mini-games much, these are all very accomplishable to do in a short amount of time. I found I didn't need to use the interactive map at all because you only travelling within a few scenes at a time before you move on. So, do you get the CE or SE? 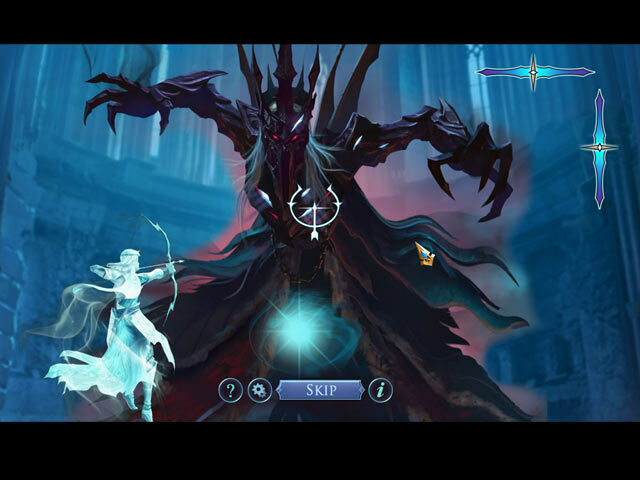 In the CE, the bonus game carries on from the main game. There are also 23 crowns to find, some of which are very well hidden. This is the first game in ages that I really had to look hard to find them. There are 8 collections (characters) to find, which are very easy. My personal preference here would be the CE. All up the game and bonus took me about 6 hours or so, playing during the week. I thought it was quite a long game, probably because there is so much to do in each scene. Overall, a decent adventure game with a sense of urgency that will keep you busy. Happy playing fishies. Rated 4 out of 5 by dancemom1 from I need a fire extinguisher! Hello friends! As usual, I review mostly on the game play and leave the rest to others, although I do reserve the right to comment on the story as well. Well, we have #7 in this series. Yep, got them all, liked them all. Graphics in this game are extremely well done, and very clear when moving in and out of close ups. Animation is exceptional, with smooth body movements, and have realistic facial movements. Game play was very good, with no problems during the demo and the scenes fit my large screen quite nicely. Voices were very nice and were age and character appropriate, although we did not have much in the way of character interaction. It's easier to get into a story if the characters speak more, or if you have really great sfx. You can click through dialog if you read faster than they speak, and not miss any of the story line or clues. We had very little music, but the sfx were pretty nice, when we had them. I was surprised to see that the dev had cleaned up the colors, which were very nice and clear and we didn't have the usual blues or pinks in this addition. HOPs are really well done, varied and different. We have silhouettes, puzzles within a HOP, IHOPs and match. 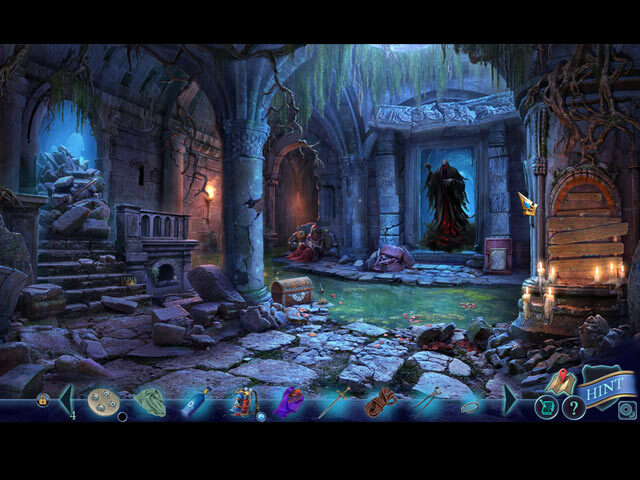 Items are not difficult to find and the scenes are mostly fairly clear. I did not see that you could switch to something other than the HOP. Puzzles were fairly simple, but some did take a bit of time to complete. I do like the ability to reduce skip time down to one second, rather than 15. The hint system is very helpful and it does transport to longer locations. You do a lot of backtracking in this game, and you are constantly on the move. I did not care for the map, but we have the transport, so I didn't need to use it. It does show if you have missed a collectible in one of the areas. Collectibles were not many, but challenging to find. We have 8 character statuettes that are large and easy to spot. We also have 23 crowns that are well blended into background colors and features. They are not as easy to see as you may think. This story line isn't anything new, but it flowed well and had a lot of action to keep you interested and moving. I did downgrade this one because it is so quiet, and not much character interaction, but I found it entertaining and feel that it will pick up as we progress. That said, I found the game to be well put together and have given it a 4.5. I think all levels of players will find this one worth the CE price. Yes, I am going to add it to my CE collection. As always, try it for yourself and see what you think. We all have different tastes in games and you may not care for this one at all. Thanks for the reviews. Rated 4 out of 5 by Granny_Gruff from The Valor of Their Ancestors is Killing the Descendants An evil king is trapped in his castle and defeat seems inevitable. But the old reprobate has one more trick up his sleeve. He puts his soul into a dagger just as the leaders of the rebellion break through the castle gates. They have won, but only temporarily! Many years later you are called in to help investigate an attack on a police station by Detective Duncan. He knows your reputation with supernatural cases. An attacker with superhuman strength has ravaged the local police station and your help is needed. Good stuff: A variety of HOPs, lots of mini-games and puzzles, great artwork, and a well written mystery story unite to form the newest entry in the Mystery of the Ancients series. Bad stuff: I really like the story and the game play, but I had to deduct one star for bad logic, which reared it's ugly head and kept me from completely enjoying the story and game play. I won't depress us both by listing the sad details, but hopefully you can see past them. Bottom line: I played through the CE version and enjoyed it, but ran into trouble with some of the longer puzzles when they did not work as intended. If you did not try the Demo when the CE came out, please try it now. The bonus chapter was fine, but I would not have missed it if I'd waited for the SE. This leaves you with an open field to choose either version. Good gaming.